A COMMENTARY: Duterte enjoys a high level of public support nationwide. Although far from being controversy-free, over the last six months he has begun to put flesh to the bones of his three priorities: improving law and order, making socio-economic growth more inclusive, and restructuring the form of government. It appears that his result-oriented and hands-on approach to governance are striking a powerful chord among Filipinos. The public believes that the man who transformed Davao can replicate his results around the country. The figures from the December surveys of Pulse Asia and SWS are consistent in showing that the public trusts the president. SWS reports that 81 percent of its respondents said that they had ‘much trust’ in the president, as opposed to only 9 percent who say that have ‘little trust.’ Pulse Asia reports that 83 percent of its respondents expressed trust in the president, whereas 4 percent said they distrust the president. The president’s December ratings are about par with those he received in September. The president maintains his level of support across different classes, locations, sexes, age groups, and levels of education. Among all Filipinos, Mindanaoans trust him the most, with around 90 percent (SWS) or 92 percent (Pulse Asia) saying they trust him. 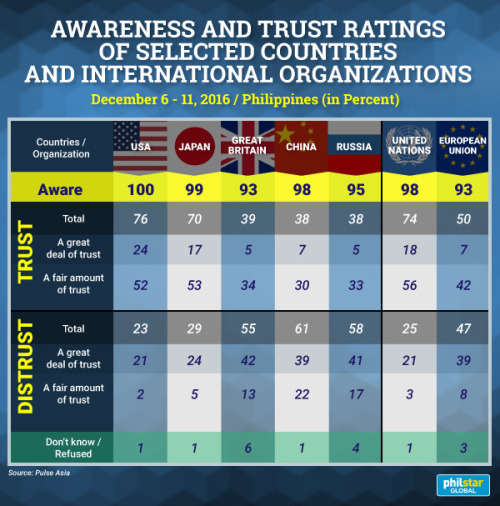 The one negative mark that stands out is from classes A, B, and C nationwide, where he is down to 72 percent trust in December from 85 percent trust in September (Pulse Asia). It seems that the general public welcomes Duterte’s ongoing directives to improve the law and order situation, particularly through his nationwide anti-drug campaign. Of course, there are limits. 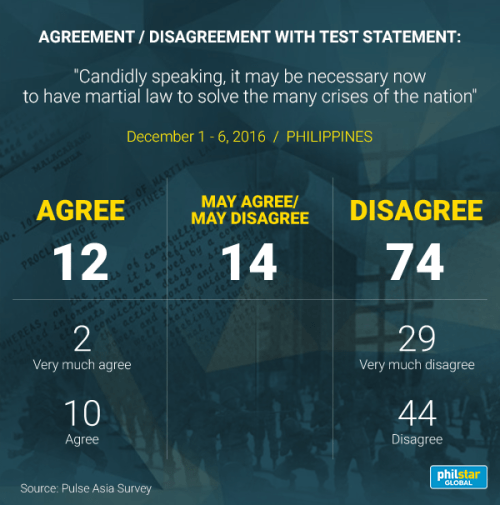 74 percent of Filipinos said they do not believe that martial law is currently necessary to resolve the country’s problems (Pulse Asia). 94 percent said that it was important to keep drug suspects alive, with 71 percent saying that it was very important (SWS). We do not have fine-grained public feedback on all of the government’s initiatives, but safe to say there are many possible contributors to the people’s positive response. In addition to the drug war, Duterte has also shown a firm hand on resolving internal armed threats, cracking down on the Abu Sayyaf Group while resuming the peace processes with the Communist and Moro fronts. The Bangsamoro Transition Commission is expected to complete its new draft Bangsamoro Basic Law by July of this year. Moreover, there is much to be said about the administration’s efforts vis-à-vis Freedom of Information, the enactment of an anti-corruption hotline, and the initiation of a tax reform program that would reduce the income tax burden of millions of Filipinos. The economy continues to hum along. Duterte has been openly “hands off” on economic management, and the administration has promised to continue the sound macroeconomic policies it inherited from the Aquino administration. Beyond that, the administration appears serious in its efforts to jumpstart a “Golden Age of Infrastructure.” Economists project that the country will grow by at least 6.2 percent in the next two years (World Bank and ADB). More directly for the poor, the president has been consistent in his support of Reproductive Health programs and in maintaining the Pantawid Pamilyang Pilipino Program. Such support could be important in boosting his credibility among the most marginalized sectors of society. At the same time, Duterte’s pursuit of a so-called “independent foreign policy” has drawn more mixed reactions from society. 51 percent of Filipinos agreed with that Duterte’s habit of publicly cursing foreign or international officials is harmful to the Philippines’ foreign relations (SWS). Moreover, while the full normalization of bilateral relations, a greater inflow of Chinese investment and aid, and the opening of the Chinese market for more Filipino goods are positives for the Philippine economy, many Filipinos are still wary of China. In September, only 22 percent of Filipinos had much trust in China, with 55 percent saying they had little trust (SWS). In December, 61 percent told Pulse Asia they distrusted China. Russia did only slightly better, with 58 percent registering distrust (Pulse Asia). Despite the president’s good overall rating from Filipinos, he should avoid any temptation to rest on his laurels. For the administration to maintain or even boost its support from the people, it needs to continually deliver on its many promises. Having raised the bar for themselves, the administration may find the public’s expectations for their performance to grow more burdensome with time. The administration would do well to shine more of a spotlight on some of the public’s most urgent concerns. Filipinos are most concerned with having jobs and sufficient income, which ranked as the top-2 urgent national concerns (Pulse Asia). Although official government unemployment figures are at a low, the administration should listen to and address the people’s fears. Second, the administration should not read the public’s support as an all-encompassing mandate for its law and order operations. People want drug suspects captured, not killed. Given his political skill, Duterte should be able to express his support for the police while simultaneously reassuring citizens that he does not tolerate deadly excesses. He can stave off doubts by focusing on justice system reform and increasing the public’s confidence in the due process of law. Finally, the president has benefited from subsided media interest in his foreign policy outbursts, but they continue. He can maintain his message of independence without incendiary turns. Filipinos have given him the benefit of the doubt, but there is no such expectation from members of the international community. Many of the concerns he highlights, such as the rise of ISIS, are global in nature. This means keeping our friends.